I decided to turn my King Canyon trail hike into a loop, returning along the Gould Mine Trail. Multi-colored tailing piles slide down the hillsides, and saguaro cacti stand watch around this abandoned building above the old mine. 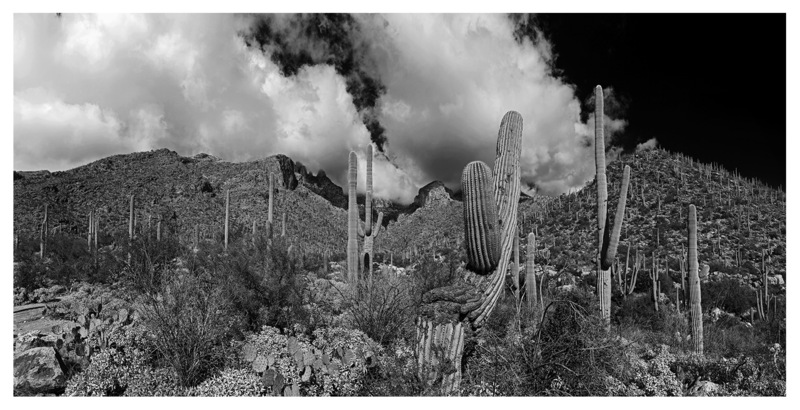 Last month, I walked up the King Canyon trail in Saguaro National Park West (Tucson Mountain District). On the saddle below Wasson Peak, I stopped to photograph a few of the small cacti and the high, wispy cirrus clouds. 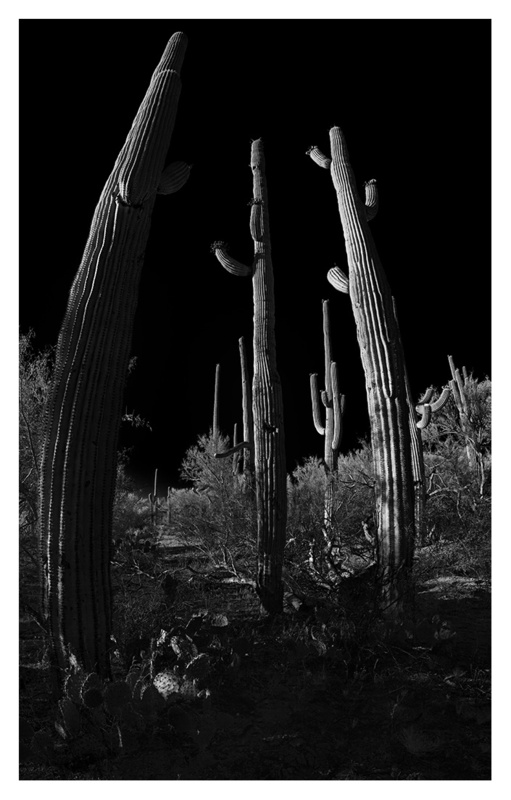 Here is a vertical panorama of a baby saguaro and the surrounding prickly pear cacti. 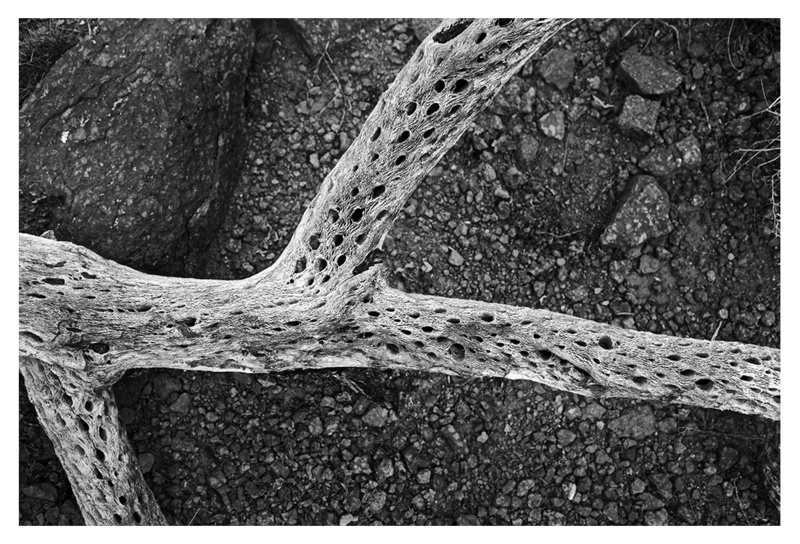 Cholla cacti skeletons are scattered across the landscape in Organ Pipe Cactus National Park. 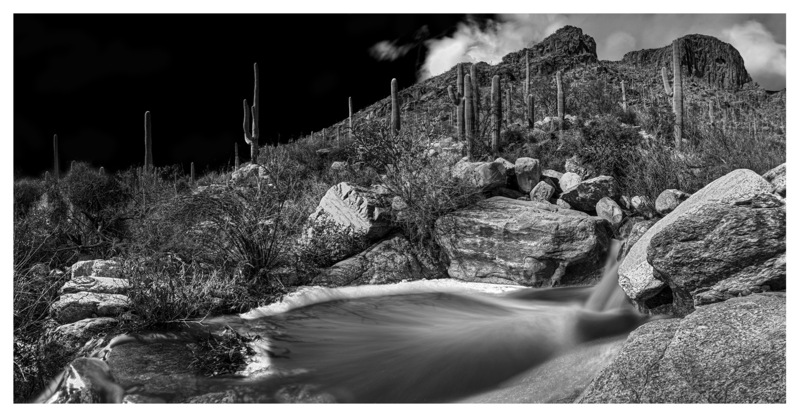 Here are a few more panoramas from the Ironwood Forest National Monument. One of my favorite parts of this hike and scramble was watching the clouds’ shadows slide across the desert landscape below Ragged Top. Compared to last year, this has been a relatively wet winter in Arizona. Once every week or two, clouds have rolled in off the Pacific Ocean and delivered a few hours of light rain, leaving the desert smelling like moist dirt and wet creosote bushes. After one of these winter rains a few weeks ago, I hiked up the Finger Rock canyon trail to take a few photographs of the clouds hanging over the cliffs. During late fall and early winter, the cacti in southern Arizona tend to shrivel up as they use their last remaining water before the winter precipitation starts. This year, the rains haven’t really arrived in force, and many of the cacti appear shrunken and desiccated. I took this panorama of a prickly pear cactus while on a trail run just outside Tucson in Pima Canyon.